This is supposed to trim the movie for better pacing and to get rid of some too long scenes, especially the 6-minutes dream sequence. 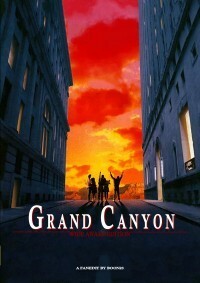 Grand Canyon is a good movie, but what started so interesting looses its drive starting with a very long dream sequence and kind of less interesting events in the second half of the movie. What is for many the “L.A.CRASH” of the 90s lacks a bit drama and suspense. Still there are wonderful scenes in this movie, no audience should miss, so my intention was to create a version that better keeps the pace and does not get so superficial. - Claire jogging through the poor people’s quarters is a very superficial scene, because it is so full of stereotypes. - Mack’s affair with Dee is better to be left untold, because almost all her scenes are way over the top or feel empty. Worst part of it is when she trades her being in love with Mack to flirting with the policeman, who is single. Also her quitting and her monologue for that is a rather cold scene, intellectually well done, but heartless. - Roberto helping the boy in the camp is too heroic, he is by far too much of a good boy. Sorry, but I prefer guys that are a little bit less of a Johnboy Walton. But his driving sequence stayed (because I needed it as a filler). All in all I cut more than 20 minutes from the movie, I also replaced the final score, because to me it didn’t cause what it was supposed to cause: a feeling of something bigger than we are, a feeling of being totally impressed. I hope now it does.